It will be the great prizes that make this the outing NOT to miss. Time is running out. Make sure your car is ready to go and make sure you have LIGHTS. I'm probably missing some stuff, but there are too many boxes to go through. I guess you will just have to show up to see what else is in pile. Drove my Baja to the Jerome campout this weekend. Up I17 to Jerome about 90 miles, down to my house at Camp Verde and FR138 to Cherry RD and back on I17 to Bloody Basin rd. Across Bloody Basin RD to 7 Springs then home to Phoenix. Total checkout around 200 miles with around 100 of that on dirt. Car is ready for the river as no problems at all on the entire run. First run with the new lift and tires offroad. All works great. Stopped by and visited with Dirtjunkie today. 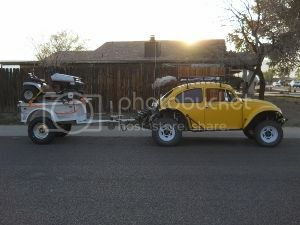 He is diligently getting the grey baja together, as well as the blue one for the play day in Nov. When we are about 30 days out I will post weekend activities. 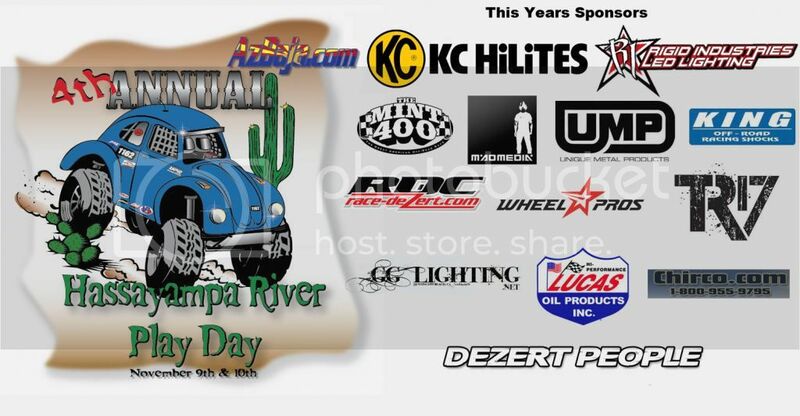 Plan on staying sat night as I will be giving out products from KC Hilites and Rigid Industries LED Lighting companies. Good stuff, believe me! AzBaja will be bring lunch and I will have an ice chest with water and cold drinks. I will also start a roll call so we can get an idea how many people will be there. Keep wrenching folks. Just over one month to go! if you like me to help... I could bring a bigger grill and the best mesquite charcoal on the planet to use to make lunch. Eric (AZ Baja) the Las Vegas contengent of the Pruett family will be there with the motor home and we always make our bathroom available to the ladies . what time do you think you will be there? I was talking with Eric (azbaja) he brought up a good point.. The starting line for all the events is going to be in the wash and people are going to want to camp and be at the starting line.. If we camp anywhere else we will be dividing the event.. After thinking about it,,, I'm not sure that that would be a good idea.. I was planning on pre-running the river bottom from Wickenburg to I 10 the weekend before not sure if I'm going on Saturday or Sunday it depends on the better turnout..
Tony seems to be in charge of this event I was going to reach out to Tony about the placement of the coaches.. If we position them just right we can block most of the wind and the dust and maximize our shade..